The Left Alliance between the UML and the Maoists was expected to win parliamentary and provincial elections, but not so thunderously. After two nights and one day of vote counting, it looks like the Left Alliance will not only win an absolute majority, but could also secure a two-thirds. As of Saturday morning, the UML and the Maoists have altogether won 28 and are leading in 77 constituencies – nearly two thirds of 165 parliamentary seats under the First Past the Post (FPTP) system. The Left Alliance may fall short of winning a two-third under the FPTP system, but it could make up for it by winning most of the 110 seats under the Proportional Representation (PR) system. If that happens, the Communists will not only rule Nepal for the next five years but could also amend any clauses of the Constitution. The UML alone has already won 23 seats and is leading 49 constituencies. The Maoists have won 5 seats and are leading in 27 seats. These early results show that they will also win an overwhelming number of PR votes. 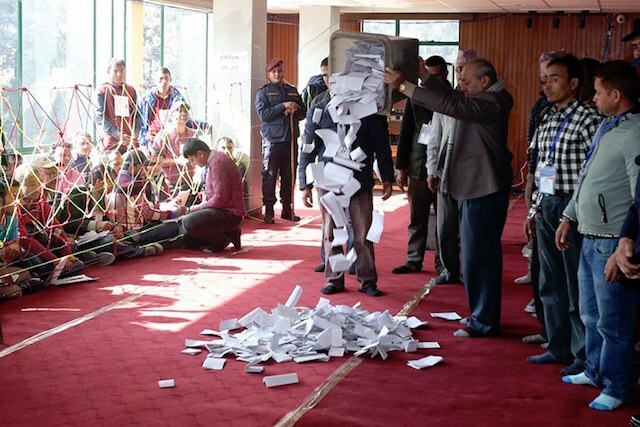 The ruling Nepali Congress is trailing behind the Maoists, and not the UML. It has won just 4 seats so far and is leading in 20 constituencies – a number just slightly better than the combined performance of two Madhes-based parties. The Federal Socialist Forum Nepal and the Rashtriya Janata Party Nepal are leading in 9 and 8 constituencies respectively. While most NC candidates bit the dust at the hands of UML-Maoist candidates in the hills, it was the Madhesi parties that pushed them to a corner in the Tarai. Even in the elections for provincial assemblies, the so-called Democratic Alliance between the NC, the Madhesis and the royalist RPPs is lagging far behind the Left Alliance. The rise of the Communists and the fall of the NC means that people have voted for political stability and economic prosperity – a promise the UML-Maoists made ahead of elections. It also shows that the people did not believe the NC’s warnings that the UML-Maoists would hijack democracy and impose authoritarian rule. Analysts say the main reasons for the NC’s decline were its role during the Indian blockade, support for corrupt leaders, lack of an appealing slogan, anti-incumbency factor and weak party organisation. On the other hand, the Left Alliance understood what the people wanted after decades of turbulent transition. UML Chair KP Oli’s nationalist image also worked in their favour. Most importantly, the UML’s party organisation was much stronger than the NC’s, and it was consolidated when it forged an alliance with the Maoists. Many NC heavyweights have already bitten the dust and are lagging far behind UML-Maoist candidates. Although NC President and Prime Minister Sher Bahadur Deuba is on his way to seal another victory in Dadeldhura, other NC leaders like Ram Chandra Poudel, Bimalendra Nidhi, Shekhar Koirala, Ram Saran Mahat, Prakash Sharan Mahat, Nabindra Raj Joshi and Bijaya Kumar Gachhadar have already lost or are losing. On the other hand, UML Chair KP Oli is winning by a huge margin. So are Madhav Nepal, Jhala Nath Khanal, Subash Nembang and Yogesh Bhattarai. Maoist leaders Pushpa Kamal Dahal, Barsaman Pun and others are also winning comfortably. The poor performance of the pro-Hindu, royalist RPPs mean that people are against the idea of mixing politics with religion. Bibeksheel Sajha Party, an alternative force promising political reforms, has not won a single seat. But some of its candidates, especially journalist-turned-politician Rabindra Mishra, have given tough fights to NC and UML heavyweights. This shows that it may win a respectable total of PR votes. In Gorkha-2, after initially lagging behind Maoist candidate Narayan Kaji Shrestha, NC-backed Naya Shakti party Chair Baburam Bhattarai is leading. But he may be the only candidate to win from Naya Shakti. Congress needed to suffer heavy loss to get away from Koirala clique and cronyism. New blood needs to be pumped or else suffer fate of Indian Congress. Educated lot needs to rise up and ol fogies our. We are witnessing that the people of Nepal are not only misinformed by interested parties, they are loyal and traditional therefore Bibishek Nepal with young people does not inspire confidence. The problem is the politician is just one mouth, more important are group decisions thaw will move Nepal into the new era. Future is for new generations, make a simbolic funeral for all current politicians, keep them as advisor but eough is enough since 20 years. Jay NEPAL. Chris Avison: Well said Seth. Ed Hillary was the Patron of the first successful Irish expedition to climb Mount Everest in May 1993. The leader was Dawson Stelfox, who is Patron of Irish Nepalese Educational Trust (INET), a charity born out of that expedition. Today, several schools and community buildings are up and running, together with a few more in the pipeline. Along with this small scale support, INET encourages environmental and health education. There is no doubt that Ed Hillary was the spark that set this alight, along with the enthusiasm of the Irish climbers and their Nepalese friends who travelled with them. Of course, none of these things are possible without the generosity of the friendly and hard working Nepalese themselves. anonymous: We are witnessing that the people of Nepal are not only misinformed by interested parties, they are loyal and traditional therefore Bibishek Nepal with young people does not inspire confidence. The problem is the politician is just one mouth, more important are group decisions thaw will move Nepal into the new era. All fighting communists, maoists should be voted OUT they created the problem no one mended potholes now lets say time is UP> Future is for new generations, make a simbolic funeral for all current politicians, keep them as advisor but eough is enough since 20 years. Jay NEPAL. anonymous: Usually proven result gives more money than forever cloudy info. Arne Walderhaug: Two years on, still wondering if I will be to land at Pokhara International before I’m six foot under. Shree Shrestha: What’s wrong with building concrete retaining wall? KMC should have built surrounding areas park like and leave the temple to be rebuilt by originalists. The way it’s going on Ranipokhari will become garbage dump site. gary Parkinson: Not for one moment do I believe this.An excuse for this corrupt government to carry on stealing more international money.They have a fine record on this,money has obviously been filtered into their own coffers. Madhav: Repercussions of Kathmandu running Hashtag gobackindia. Anyway it’s good as social media nationalist must have pledged billions of dollars themselves. Charity begins at home. Bhumsen: Lets assume Nepal got all the money. Then politicians and government officers will siphon the money anyway. Poor Nepali will never get their hands in the fund. In the name of development, funds will dry out. It is better if donors dont send money. Nepali needs to learn to be independent. Down with Corruption. Anonimous: Animal sacrifice must be erradicated! Crony n chronic party: Congress needed to suffer heavy loss to get away from Koirala clique and cronyism. New blood needs to be pumped or else suffer fate of Indian Congress. Educated lot needs to rise up and ol fogies our.